Vacation rental lodge. 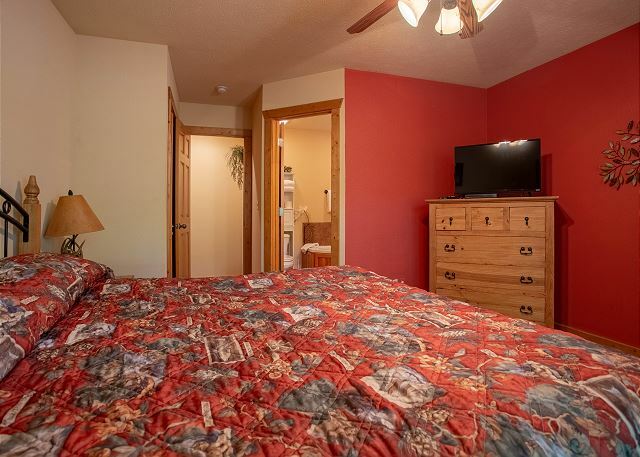 Sleeps 4, 1 bedroom, 1.5 bathrooms. Dogs allowed. 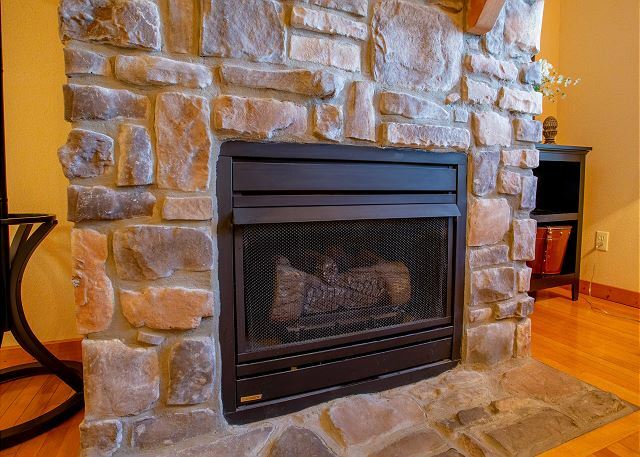 Cozy up and get toasty next to the fireplace in this rustic one bedroom getaway!Find some peace and quiet in this vacation rental, located in the scenic Stonebridge Resort. 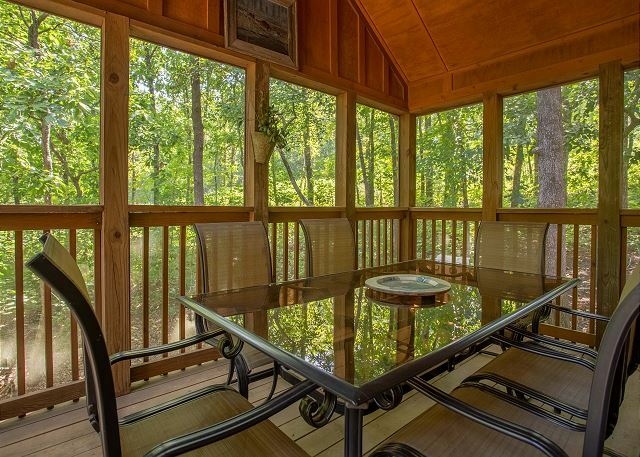 Stretch your legs and breathe in the fresh Ozark Mountain air on the private screened-in deck. 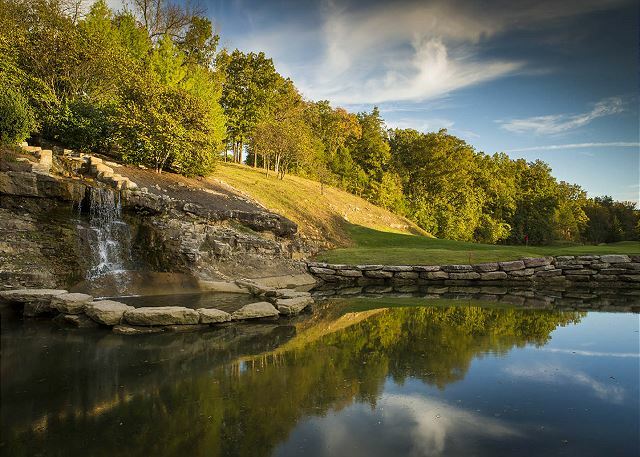 When quiet time has come and gone, go play some holes at LedgeStone Golf Course or take a dip one of the two community pools located in the resort! Take a quick drive to Table Rock Lake and experience the amazing bass fishing, enjoy the feeling of catching your own dinner. No matter what you do, you're sure to have a bear-y good time in Branson! 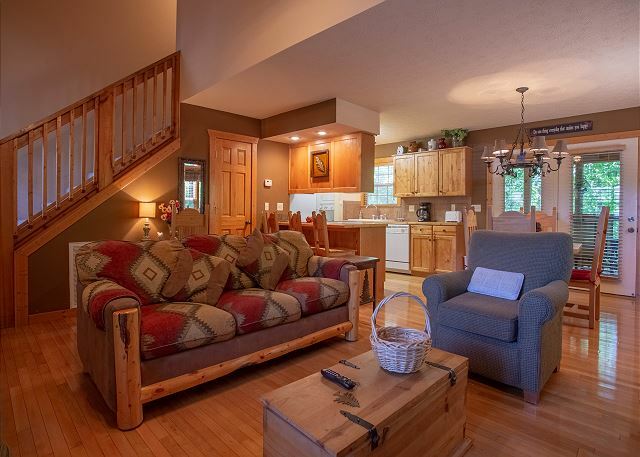 Great location, super clean, quiet, and a nice get away. Only thing we wished was better was the, Bed which was a concave from it being a old spring type and was noisy from the springs. Wasn't able to use to the hot water to take a bath. Handle kept spinning and then cracked in half. Was disappointing after a long day of hiking. Other wise great place to stay, would be back. I would recommend this property and I would stay here in the future. It was clean and well-maintained. The location for us was great for the activities we had planned in the area. Birthday VayCay Nancy M. Spring Hill, Ks. We were extremely pleased with our Beary Cozy Cabin. It was absolutely perfect for us. Thank you Scott for your multiple repeat business with us here at Sunset Nightly Rentals! I know your dog Charlie loves to be able to travel with you! Nice place to getaway for weekend. Didn't spend much time outside due to the heat. Only recommendation would be to update the TVs - flat screens w more viewing area would be much better. 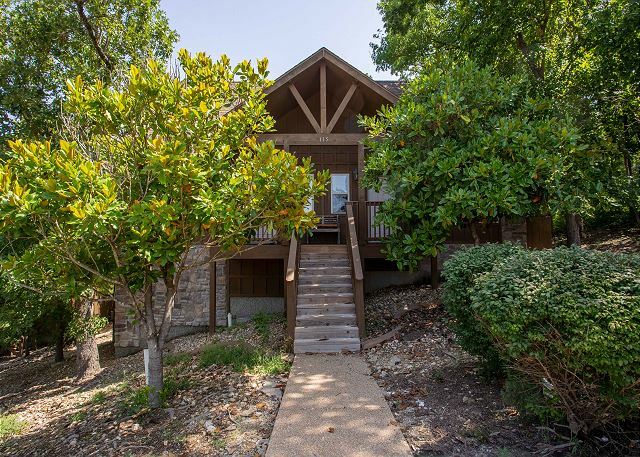 Having spent many, many weekends in Branson, this cabin is one of the best properties we have stayed in. Nice clean. Bed was comfy. That is always important. Need new guest book. The cabin was clean and nicely furnished. We enjoyed the screened in back porch and our dog also enjoyed it. The kitchen is large enough to prepare meals and has plenty of counter space. The cookware was limited. They were very accommodating. Also love we were able to bring our furbabies! The one thing or two things I'll say about renting with Sunset Nightly Rentals is, they think of everything. I could have just showen up with my clothes and food and never left the cabin. The cabin was clean and was in great shape. The kitchen was well stocked with plates, pans, silver wear, towels, I could go on and on. I would recommend this location and company to anyone looking for a great get away. My husband, dog, and I stayed here for a long weekend getaway. It was an amazing cabin with the coziest feel. The only major turn off was that our oven didn't work! Everything I brought was pre-made and ready to bake. I had to throw all of my dishes away! My husband had to go out and buy a small grill just so we wouldn't have to waste our meat as well as all new food for meals. It was super disappointing and costly for us. The rental company had a repair man come to the cabin (which really took away from our getaway) to look at the oven. He wasn't able to fix it. The company compensated only an 1/8th of the total cost for the inconvenience. Huge upset considering how excited we were to have a trip where we wouldn't have to leave the cabin. Great property and trip overall, we would definitely go back. Just make sure all appliances work! Great, but did not realize it was a duplex until after I rented it and the iteniary said it was 94b. The pictue shown of the outside is a little misleading , although half of the cabin was plenty big for two adults. Your WiFi was very fast once I rebooted the modem. The cabin was very nice,and quite. We enjoyed it. The only down side was we had to wait over hour or so to get in, the key box did not work. After a 12 hour drive all we wanted to do, is, to get in, unpacked and get some to eat, we had two dogs with us and the wanted to eat too. Please do something about the lock box. The check out time was to early also. We did not get in until after 7:30pm. and had to check out by 10:00am. So we paid for a 9days and stayed 8. We did not get a call from the property management, saying how sorry they was, and they knew it was a problem before we check in. The property was nice but, the property management was just ok.